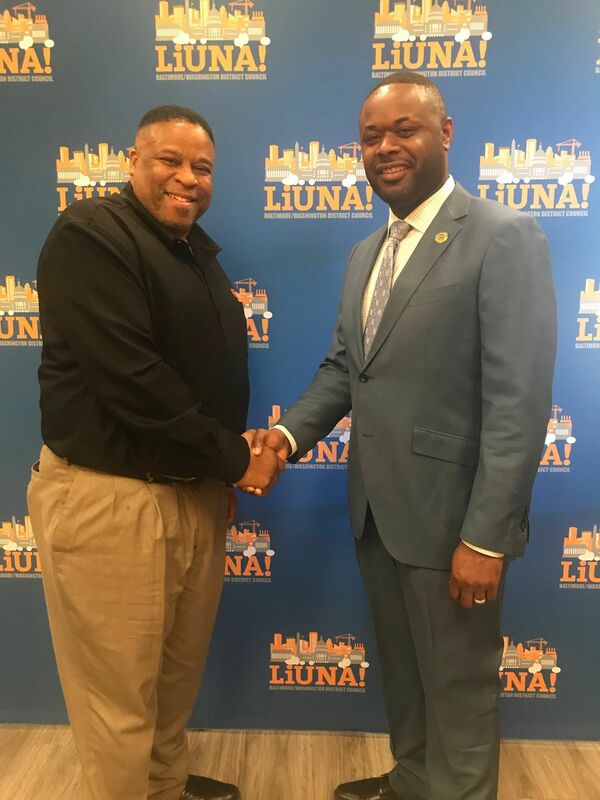 Baltimore, MD (March 26, 2018) -- The Baltimore Washington Laborers' District Council (BWLDC), an affiliate of the Laborers' International Union of North America (LIUNA), announced today of its endorsement of Cory McCray for State Senate in Maryland's 45th District. The BWLDC represents more than 7,000 LIUNA members who live and work in the Baltimore/Washington region, including approximately 1,000 members from the Baltimore City area. "Cory McCray fights for working families. As Delegate to Maryland's 45th district, he has led the charge in supporting policies that benefit working people and help build Baltimore’s middle class. As a journeyman electrician, Cory knows firsthand the struggles of working families in East Baltimore, which is why we think he’s the best choice for the Senate in District 45,” said David Allison, Business Manager of the Baltimore Washington Laborers’ District Council. During the 2017 Maryland General Assembly Session, Delegate McCray stood with the BWLDC to pass House Bill 467, the Providing our Workers Education and Readiness Apprenticeship Act, which increases the use of Maryland certified apprentices on state capital and infrastructure construction. Across the Baltimore-Washington region, the Council is actively endorsing and supporting candidates for elected office who are aligned with the values of its members. Today’s endorsement of Cory McCray is a continuation of that effort. The Baltimore Washington Laborers’ District Council, an affiliate of the Laborers’ International Union of North America (LIUNA), represents more than 7,000 LIUNA members who live and work in the Baltimore-Washington region.